‹ Cudo, Groupon, Scoopon, Spreetz, BuyWithMe, LivingSocial, etc. February 2, 2011 Do my eyes look fat in this? These last two days have been – no kidding – the hottest days I can ever remember. Ever. I’ve had to abandon walking across the street from my office to get a delicious, ice-cold Diet Coke from the shop (best part of my morning). Walking outside is like stepping into a microwave. I feel like an ant. You expect to look up and see a giant child hovering over you with a magnifying glass. It’s that bad. Yesterday I worked both jobs and got home around 1am. And I couldn’t sleep. This is a list of all the forces that have combined to deprive me of sleep last night. At one point I was sitting straight up in bed clutching a pillow in shaking hands and leaning over his face. Not lying. This is what I look like today. Posted under ALL of my anger is rational. 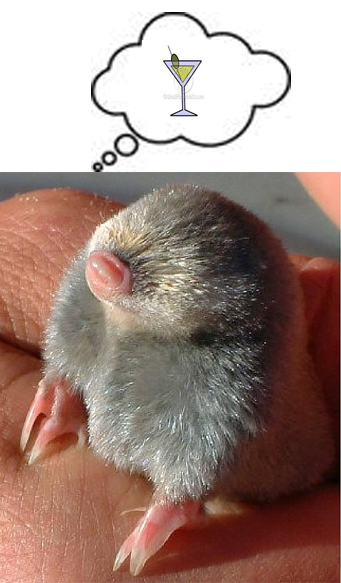 can’t stop staring at this mole picture – horribly creepy……….and yet im still looking. is that its front end or back endl? ?